Edited by Nobel Prize-winner Ilya Prigogine and renowned authority Stuart A. Rice, the Advances in Chemical Physics series provides a forum for critical, authoritative evaluations in every area of the discipline. In a format that encourages the expression of individual points of view, experts in the field present comprehensive analyses of subjects of interest. 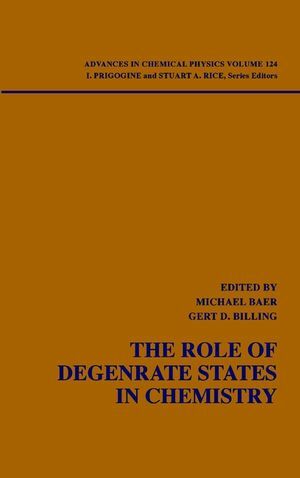 This stand-alone, special topics volume, edited by Gert D. Billing of the University of Copenhagen and Michael Baer of the Soreq Nuclear Research Center in Yavne, Israel, reports recent advances on the role of degenerate states in chemistry. Volume 124 collects innovative papers on "Complex States of Simple Molecular Systems," "Electron Nuclear Dynamics," "Conical Intersections and the Spin-Orbit Interaction," and many more related topics. Advances in Chemical Physics remains the premier venue for presentations of new findings in its field. Gert D. Billing is Professor in the Department of Chemistry at the University of Copenhagen. Michael Baer is Professor in the Applied Physics Division at Soreq NRC in Israel. Early Perspectives on Geometric Phase (M. S. Child). The Electronic Non-Adiabatic Coupling Term in Molecular Systems: A Theoretical Approach (By Michael Baer). Non-Adiabatic Effects in Chemical Reactions: Extended Born-Oppenheimer Equations and Its Applications (Satrajit Adhikari and Gert Due Billing). Complex States of Simple Molecular Systems (R. Englman and A. Yahalom). Quantum Reaction Dynamics for Multiple Electronic States (Aron Kuppermann and Ravinder Abrol). Electron Nuclear Dynamics (Yngve Öhrn and Erik Deumens). Applying Direct Molecular Dynamics to Non-Adiabatic Systems (G. A. Worth and M. A. Robb). Conical Intersections in Molecular Photochemistry: The Phase-Change Approach (Yehuda Haas and Shmuel Zilberg). The Crude Born-Oppenheimer Adiabatic Approximation of Molecular Potential Energies (K. K. Liang, J. C. Jiang, V. V. Kislov, A. M. Mebel, and S. H. Lin). Conical Intersections and the Spin-Orbit Interaction (Spiridoula Matsika and David R. Yarkony). Renner-Teller Effect and Spin-Orbit Coupling in Triatomic and Tetraatomic Molecules (Miljenko Peric and Sigrid D. Peyerimhoff). Permutational Symmetry and the Role of Nuclear Spin in the Vibrational Spectra of Molecules in Doubly Degenerate Electronic States: The Trimers of 2S Atoms (J. C. Varandas and Z. R. Xu).